Nepal is a river runner's paradise - no other country has such a choice of multi-day trips, away from roads, in such magnificent mountain surroundings, with warm rivers, a semi tropical climate, impressive geography, exotic cultures, wildlife and friendly welcoming people! But it's not just the rivers - as anyone who has been there will tell you, Nepal is a magnificent holiday in its own right - a fairy tale land of temples, mountains, dramatic festivals, exotic culture, colorful people, medieval villages, superb craft shopping, great food and sights - the bonus is some of the World's best rivers! Rafting in Nepal is usually a 'wilderness' experience in that most rivers don't have highways alongside them - but it's a soft, tamed, wilderness with white beaches for camping, clean blue rivers, friendly locals and few 'nasties' - someone described it as 'blissful escapism'! Incredibly inexpensive, Nepal is a where rafters and kayakers get a warm welcome as one of the best forms of ecotourism. White water rafting means cruising down a rushing river in an inflatable rubber raft or white water kayak over crashing waves and swirling rapids for the excitement of a lifetime. Nepal has earned a reputation as one of the best destinations in the world for white water rafting. Nepal's thundering waters, coming from the glaciers of the mighty Himalaya, provide unmatched thrills for rafting and immersing oneself in the landscape. 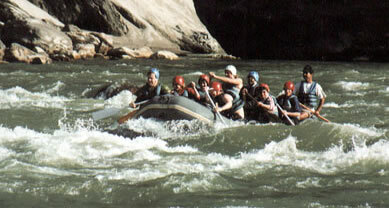 A rafting trip is bound to be the highlight of your stay in the country. Nepal's climate is dictated by the monsoon which arrives in June and usually finishes in late September. The monsoon brings torrential rains that flood the rivers so most people wouldn't want to be kayaking or rafting at this time. Peak season for tourists and for rafting is probably October through November: the monsoon is over, everything is very green, rivers are moderately high but dropping, temperatures are warm and skies are clear with fine mountain views. The only disadvantages with this time of year are that it is the peak season and airline reservations are harder to get; also you cannot be sure when the monsoon will finish: it can be a month late and this can throw your plans into chaos if you are planning on running a river where water levels are critical - as they are on many of Nepal's rivers. The winter months from late December through to early February are cold, but skies are still clear and river levels will be low. Lots of river running groups come out over Christmas and have a great time, but you certainly should expect cold water and perhaps think in terms of wet suits and dry tops. From late February through to early April is also a good time for river running - river levels are reliably low, air temperature warm, rivers warm and blue. The disadvantage is that the air is often hazy: you cannot be assured of stunning mountain views and there may be an occasional shower of rain. In the past, many kayakers and rafters have visited Nepal over the Christmas holiday, when the facts seem to suggest that Easter might he a better time. Nepal has many, many rivers but not all are navigable Therefore hereafter follows a summary of the rivers which we navigate and which you can find on the map of Nepal.